Day two consisted of walking the show floor to see what we could see. Sadly, there's wasn't anything earth shattering. Here's the first bit of non-earth-shattering rumor confirmation: LG is indeed a new manufacturer of Windows Mobile phones. 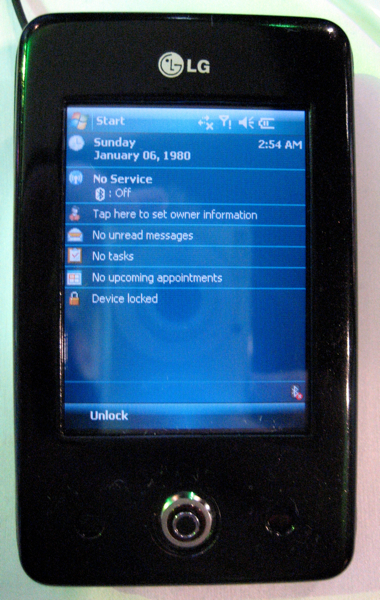 The proof is in the image on the right - a simple prototype of a WM6 device that we weren't allowed to touch. The casing: surely not what will finally come to be. 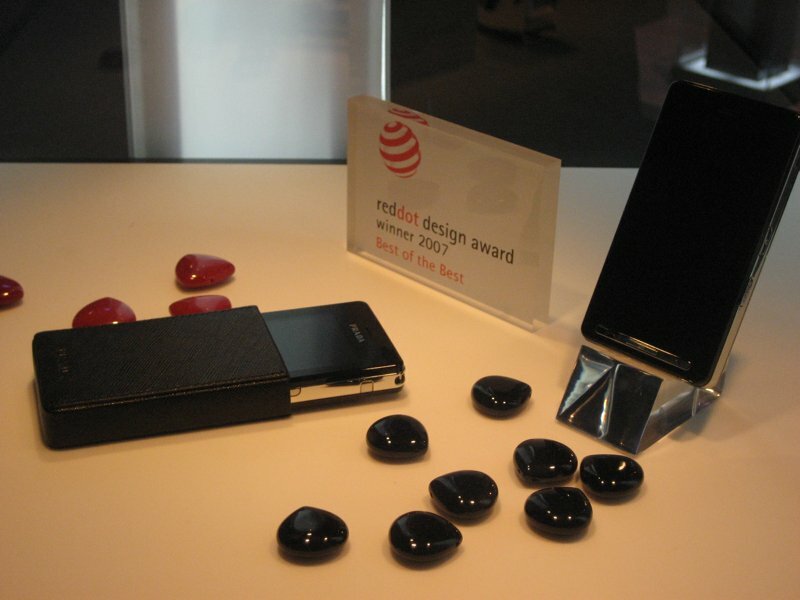 In fact, pretty much all we've learned from this is that LG is capable of slapping together a WM prototype. More images and CTIA news (including our thoughts on Microsoft's part of today's Keynote speech) after the jump. 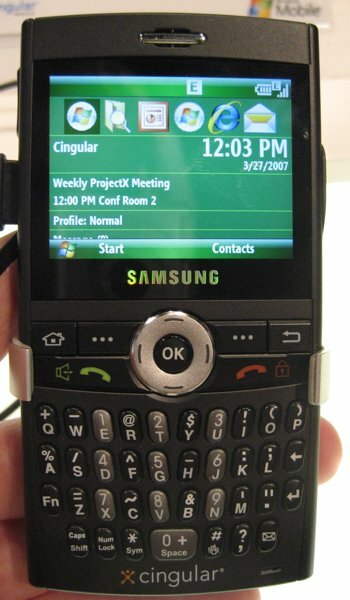 In case you didn't really believe it, here are the big three Cingular WM phones that'll be seeing the Windows Mobile 6 update: the Treo 750, the Cingular 8525, and the Samsung Blackjack. All are running WM6 with aplomb. Enough said. Well, not quit enough. 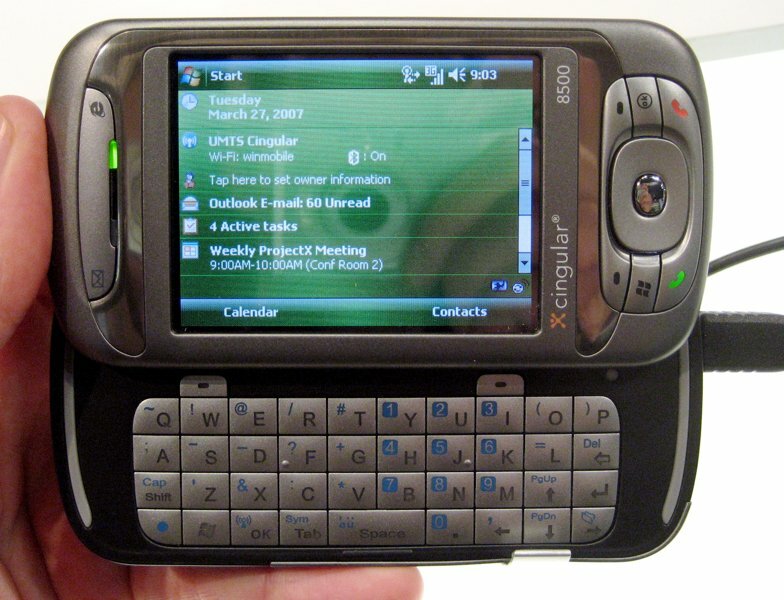 I have a message for Microsoft, Palm, Samsung, and Cingular: If you're going to announce a major upgrade for existing users - you should expect that we're going to want to know if it's free or not. It should be in the press release. If not, it should be on the tip of your tongue when I ask. What should not happen is what did happen to us over and over again: confusion that the question was even being asked. Folks: this is information we want to know. I'll tell you what I feel like - I feel like the guy on the right that got placed on a slide in a Windows Mobile 6 presentation at Microsoft's booth. Check out the expression there: it's saying "I'm really happy about this news but confused as to how exactly it's going to affect me. Today's keynote was a threefer (though Ed Zander backed out at the last minute - bad quarterly earnings must've got him down) from AT&T, RIM, and Microsoft execs. Microsoft's representative was Pieter Knook and as I've said before, anybody with "ieter" in their name is ok in my book. 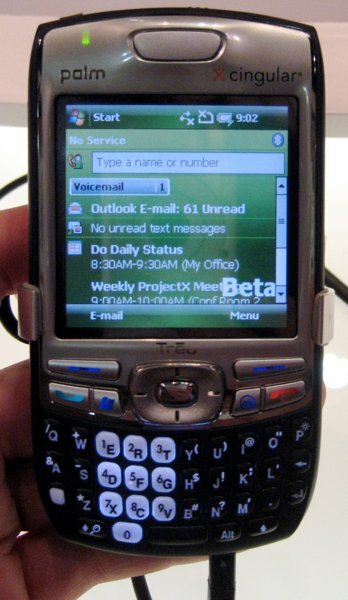 In any case, Knook's speech was all about Windows Mobile 6 (naturally) and how he's like to see it positioned in the market. He's hoping that mobile devices can "extend the promise of Web 2.0" (those of you who remember "embrace and extend", be quiet). More to the point, Knook emphasized that WM is an "open platform" - not in the evil commie "open source code" sense but in the sense that it's easy to develop for and anybody can release an app for it. Clearly it was a shot across the bows of both Blackberry and Apple - both of which lack WM's gigantic 3rd party app support. Though to be honest, the "open source" stuff rang a little hollow coming immediately after RIM listed something like 100 3rd party apps they support in lieu of actually saying something interesting in their keynote. But I digress. Some other big data points from the keynote: over 3 million WM devices shipped in the last quarter of 2006 - a 100% increase over the same quarter in 2005. Here's another shocker: there are 55 different manufacturers around the world making WM devices - including (as mentioned above) the new guys LG and Toshiba. 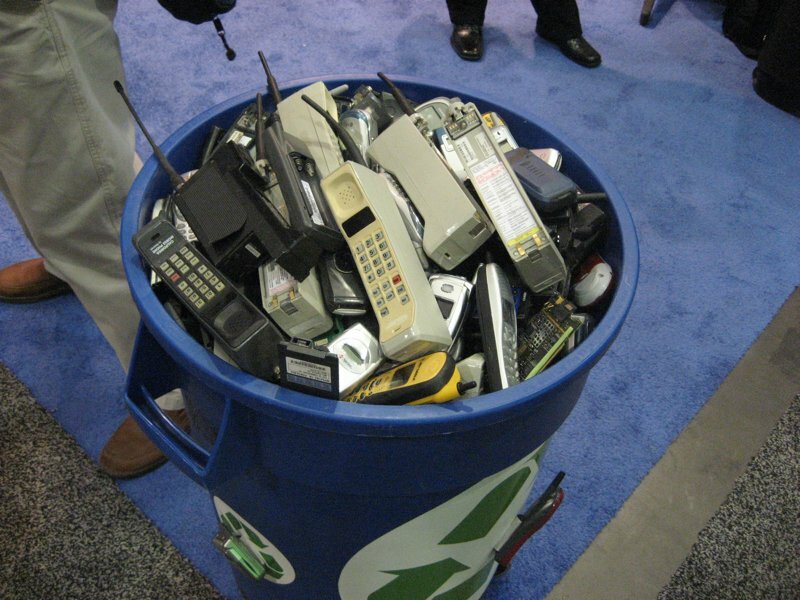 125 operators support Windows Mobile phones on their networks. Knook rounded out his speech by pointing out some necessary preconditions for real growth in the "prosumer" mobile market. Precondition number 1: simpler data plans, especially when roaming. Number 2: better mid-to-high level tech support from carriers. Hear Hear. So, my world wasn't tilted on its axis, but it was a good time. We'll finish out today's post with a photo of CTIAs gone by. Sometimes it's nice to remind ourselves what a "brick phone" really is. We'll hit the show floor one last time tomorrow - and then we'll be back to our regularly scheduled programming after that. Sadly, we won't be here for the presidential keynote on Thursday, but WM vs. PalmOS vs. iPhone vs. Linux is enough partisanship for us, let's not bring actual politics in.